‘You are a great leader and you have made me realize that there are hundreds of people in the world who are not treated the right way,” wrote Aileen Arias, 9, of Lawrence. “If you can please build more shelters for people in need. I have seen some people in Boston without homes after Hurricane Sandy. It’s very sad,” wrote Olivia Webb, 9, of Newburyport. Monday’s presidential inauguration marks the second Mail to the Chief initiative. This year 1,000 schools are sending letters to President Barack Obama, including Horace Mann Elementary in Melrose; Landmark School’s elementary program in Manchester-by-the-Sea; Muraco Elementary in Winchester; North Beverly Elementary; South Lawrence East Elementary; and Molin Upper Elementary in Newburyport. In 2008, the White House received 35,000 handwritten letters, including well wishes, suggestions for how to run the country, and inevitably, questions about the president’s dog. 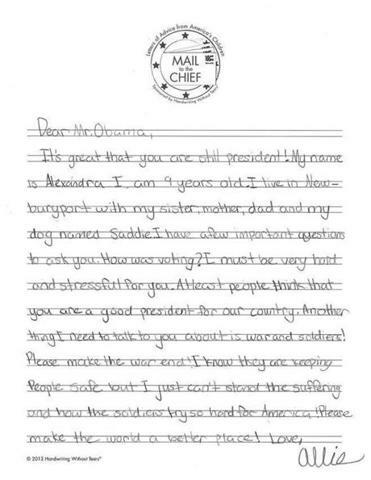 On Jan. 11, Kristen Ando’s 19 fourth-graders at South Lawrence East sat quietly in their seats, turning their biggest wishes for change in the United States into carefully handwritten letters to Obama. Some children wrote that the price of gas put a financial strain on their families. A few students requested that the president visit the school to provide advice. Many of them mentioned the need for more security in schools after the shooting of schoolchildren and staff in Newtown, Conn. in December. “Children have very, very powerful ideas, and this is a great way for them to express how they feel about the world,” said Ando. The letter-writing campaign is sponsored by Handwriting Without Tears , a national curriculum for students in kindergarten through fifth grade that guides putting words on paper. Jan Olsen, an occupational therapist and founder of Handwriting Without Tears, based in Gaithersburg, Md., said the program is an easy way to teach children the power of the written word and to encourage them to share their ideas and concerns. Ando’s class in Lawrence originally wrote Mail to the Chief letters in December, but decided to send second versions in an effort to stress the importance of revising. 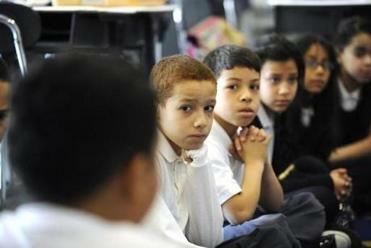 Jaidiliz Salazar, 9, changed the topic of her letter after the Newtown shooting. One Lawrence student, Bryan Billafana, 9, questioned the president’s financial management skills and challenged him to make his speeches more accessible to younger audiences. Fourth grade students discuss their ideas for letters they will write to President Obama as part of Mail to the Chief program. At left (back to camera), Jesus Marquez gives his thoughts. Andrea Phelan, a second-grade teacher at Muraco Elementary in Winchester, said her students covered a wide variety of topics in their letters. Erin Rich, an occupational therapist at Molin Upper Elementary in Newburyport, participated in Mail to the Chief for the first time with five fourth-grade classes. Rich said her students added their own artistic touches on the special paper they used. Teachers whose classes have written letters, which had to be postmarked by Jan. 15, said this year’s content differed from 2008. 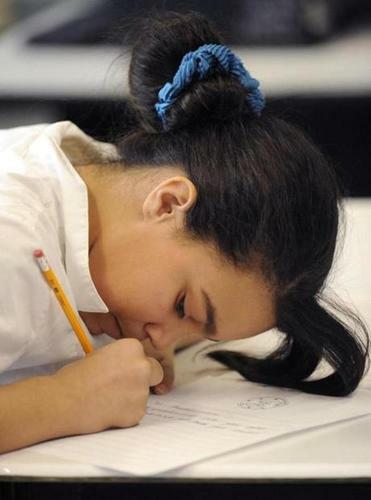 Malika Jusino, 10, uses an up close approach to her writing. Ando said that this year at South Lawrence — where 89 percent of students are Latino and 37.5 percent learned English as a second language — students took the assignment very seriously. Mary Toomey, the principal at South Lawrence — where all 24 classes wrote letters — said the activity empowers students to share their ideas.